In places where there is a large influx of displaced people in a short span of time, housing shortages are faced. More than 100 million people were estimated homeless in 2005 and in Pakistan alone, there is a shortage of more than 9 million housing units today. As a result, displaced people are forced to live in shelters and camps with inadequate living conditions, exposing them to social and health problems. In the wake of Syrian refugee crisis in 2015, we as civil engineers decided to work on a project that can negate the 2 major constraints around traditional construction that is Time and Cost. Our project aims to solve these problems through an innovative low-cost house that can be assembled in as little as three hours. To achieve the objective, modular flat-packed houses were designed with inbuilt utilities, in accordance to international standards of living. The prototype utilizes a sustainable design with a low carbon footprint yet high energy efficiency. Using which, it is possible to build large cost-effective housing colonies within a month and thus allows for better disaster management and mitigation. Rapid Urbanisation is a global phenomenon- 70% of the total population are expected to be living in Urban centers by the year 2030 and consuming 80% of the total energy. it is these mega cities where the issues of Climate Change, Social inequality, immigration and economical development will merge at once. Hence at Modulus-tech we have realized that to improve the overall quality of life in these regions, we have to move past the construction approach for housing and small scale infrastructure. A manufacturing approach to the houses can allow us to reduce the wastage, negate the carbon emissions and environmental affect of houses and allow to have a salvage value for every product that is manufactured. ModulusTech aims on applying technological advancements to revolutionize the low-cost housing sector for displaced and homeless people. 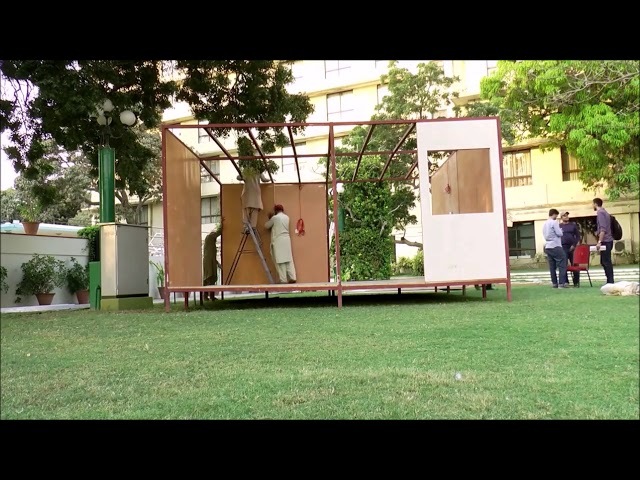 The way it works is through an innovative flat-packed house design that can be assembled in as little as 3 hours by 3 workers using simple hand tools. Its flat-pack nature allows 11 of such houses to be transported in a 40 feet container. While the modular construction allows the merger of multiple houses to be easily customized for various uses. The house also comes with all electrical and plumbing utilities included. Hence, the structure is ready for use as soon as it is assembled. Once assembled, the houses offer complete privacy with hygienic conditions to its inhabitants. This ensures that the inhabitants are provided with security, minimizing the social problems and epidemics that are prevalent in shelters and camps globally. The solution that ModulusTech provides is different in the sense that proper houses with modern utilities can be easily assembled in as little as 3 hours, a time lower than other alternatives. The easy assembly also allows any unskilled person to assemble the houses with a Do-It-Yourself methodology. Moreover, the houses offer exceptional affordability which is complemented by their flat-packed design and quick assembly times, that helps reduce transport and labor costs, respectively. With all the features that the design offers, the houses follow International Building Code 2015, hence, ensuring a good standard of living for the occupants. Another aspect was achieved by making the structure energy efficient in terms of electricity consumption and human thermal comfort. With solar integration in these houses, they can act as carbon neutral structures. The use of sustainable materials and manufacturing approach allows us to lower the carbon footprint of the structure, and as a result our product saves about 40,000 kg of Co2 emission as compared to a normal concrete structure of the same size.